Reusable packaging can play a major role in e-commerce and omnichannel fulfillment. It is important to look ahead and consider flexible solutions that can continue to add value even as your approach to fulfillment evolves. ORBIS Pally provides flexibility for e-commerce. While the increasing growth of e-commerce is presenting new challenges for order fulfillment and distribution professionals, reusable packaging products are available to help optimize the changing supply chain. 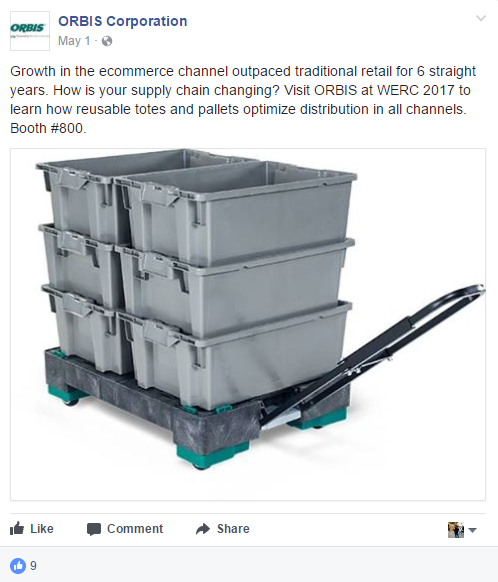 Andrea Nottestad, market manager for retail supply chain at ORBIS Corporation, recently discussed the challenges and reusable packaging solutions available to optimize e-commerce fulfillment and distribution at ProMat 2017 in conjunction with the Reusable Packaging Pavilion. 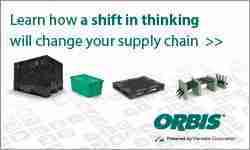 Suppliers like ORBIS are developing reusable packaging with different footprints, some devices with wheels, and adding new features to traditional projects to help businesses transition seamlessly to e-commerce. E-commerce retail sales increased more than 15% to $423 billion in 2016, marking the sixth consecutive year that e-commerce has out-paced the traditional retail channel. Although e-commerce only accounts for 8% of retail sales, double-digit growth is forecast through 2020. “The topic of e-commerce is front and center…and the impact it’s having,” said Andrea. “At the core of it is change.” Customer expectations are changing, and how they interact with retailers is changing. Such changes ripple through supply chains. Reusable packaging professionals can help customers adapt to those changes and aid them in overcoming obstacles. Carts can help boost e-commerce fulfillment efficiency. The shift in how consumers buy products at retail is creating considerable challenges for the supply chain, she noted. One such problem is how to integrate direct-to-consumer orders in facilities that have been set up to send the merchandise to retail stores, an integrative approach known as omnichannel. In the traditional retail model, merchandise was shipped one way to the store. Now, merchandise moves through more interconnected routes, more multi-directional routes. A retailer may ship goods from store to store, for example, to fulfill a customer order. Truckloads are changing; retailers are shipping smaller quantities and need to improve cube efficiency in the truck or trailer. The traditional retail supply chain — merchandise stocked in warehouses, picking those goods to fill orders, the transportation and logistics to the retailer — has gotten very efficient, noted Andrea. However, the metrics that gauge efficiency are being challenged in the e-commerce supply chain, which has numerous channels and product movements throughout the network. For example, more deliveries are going into smaller format stores that may not have a receiving dock; getting goods through the door may require a pallet with a different footprint, but that creates a change back at the distribution center level. There is a big focus on return logistics, too. One study, for example, has shown that 33% of all items purchased online will be returned. The return logistics cause breakage and damage, so there is attention on protecting merchandise in the reverse logistics supply chain to maintain it in condition so it can be sold again. 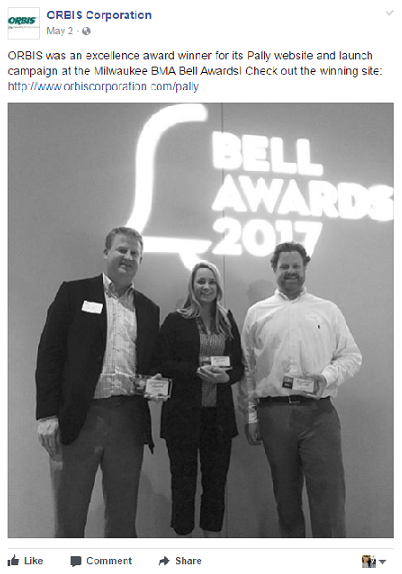 “That’s presenting opportunities for some different packaging solutions,” said Andrea. In addition, customers want convenience in the return process. Consumers are buying through the traditional in-store channel as well as online, she noted. However, whichever option they use, they share one thing in common. “They want a seamless experience,” she said. Store associates need to be “customer-facing,” not unloading trucks in a back room or performing other tasks. Interacting with customers, store employees create value by helping them find merchandise in the store or online, as well as providing other services. Retailers are looking to fulfill online orders closest to the customer because 60-73% of consumers want to shop online and pick up their order at the store. E-commerce shopping follows one of several scenarios. A customer may order goods online, and they are delivered to the home. Another option is purchasing online and picking up the order at the store or buying online, and the store ships their order. Still another possibility is picking up an order at a locker or kiosk at some location. Manually picking orders to a cart is a quick way that businesses can transition to e-commerce, said Andrea. As volume grows, a company can move to a reusable container that can go to a conveying system. As business volumes expand even more, automated storage and retrieval systems will be more efficient. For businesses where orders are being fulfilled at the store level, mobility is an important factor in packaging, said Andrea. “What we really look for is flexibility.” Store employees can pick orders in aisles, but aisles still need to be clean, organized and shopper-friendly. Stores have limited space in the rear of the building, she noted, and now orders are being picked in the back and staged for delivery or pick-up. Store employees need containers that are safe, mobile, easy to work with; they also have to be safe for customers and clean in appearance. “There’s a lot of emphasis on new products coming to the market to do this,” said Andrea. 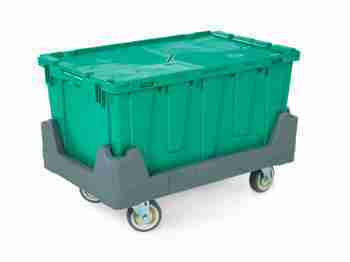 She referred to one — a wheeled container that can be quickly moved to a customer’s car. The wheels can be locked so that while the merchandise is being transferred into the car, the cart will not accidentally roll into the vehicle. “Multi-purpose solutions are critical,” said Andrea. Other considerations are for reusable containers that can be stacked and stored efficiently out of the way. Inter-facility fulfillment involving merchandise prepared for full pallet loads or floor-loaded tote shipments will involve more mixed loads and loads that are not fully unitized. There also may be a need for safety or security, keeping the merchandise concealed from view. Plastic pallets, stacking containers, containers with lids, and bulk containers are more suitable in this scenario. 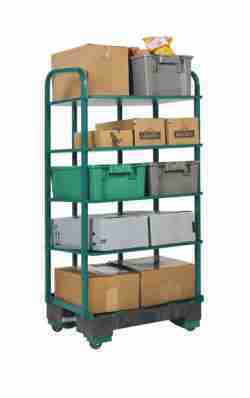 For store-to-store product movements, stack-and-nest or attached lid totes, small format pallets, and mobile solutions will be more appropriate because they will be more mobile, can be loaded on and off quickly, and do not require a forklift truck. “New footprints are coming to the market,” said Andrea. Cube efficiency will be impacted, but new solutions will address that challenge. The reverse logistics of returning merchandise presents its own challenges for packing. 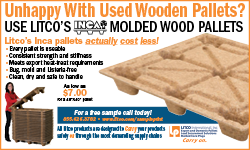 Shipments contain different products in mixed loads; they cannot be unitized on a pallet and secured with shrink wrap. Bulk containers are a good option, noted Andrea. ORBIS offers a bulk reusable container with a drop-down panel that allows an employee to step inside to put in returned merchandise. E-commerce is driving new considerations for reusable packaging, and manufacturers are developing new features for some standard products, she noted. Nestable and collapsible reusable containers are drawing a lot of attention because of storage and space considerations. 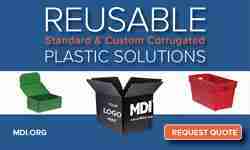 Collapsible containers require more touches to collapse the container as well as assemble it. Some applications might prefer nestable containers instead. Reusable containers with a hopper front are gaining acceptance in some applications for picking orders. It allows workers to get the product through into the container, avoiding the need to stack more containers higher and allow more clearance. The e-commerce supply chain is reacting to changes, Andrea said. Manufacturers can provide custom containers, but she urged looking ahead. “Have the eye on where you go next,” the future standards for the supply chain. As was emphasized in other ProMat presentations, planning for reusable container standards is an important element of automation projects. Alternative footprints are being developed for pallets and containers to drive truckloads vertically and allow more deliveries on a single truck. More goods are moving on footprints of 1200×1000, 800×600, and 1000×600, she said, which increase efficiency when transferring between truck sizes. The mobility of containers is becoming a factor in packaging decisions because e-commerce is driving more applications for them, such as dollies. 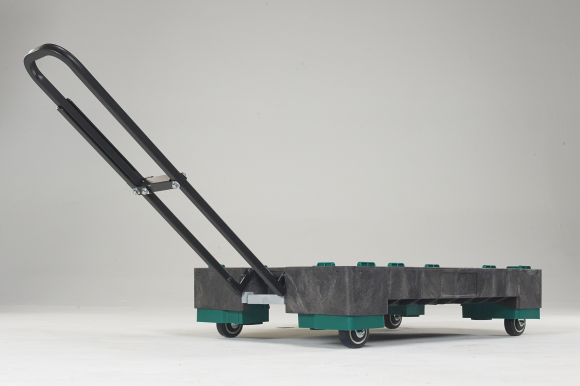 There is increased focus on casters for dollies and other containers and such factors as locking, durability, and noise minimization. One useful product is the ORBIS Pally. It has wheels like a dolly, but these can be retracted to facilitate forklift handling in a distribution center environment. At retail, a worker can press the pedal to wheel it away. It is one example of reusable container solutions that are being developed to combine and connect the distribution and retail aspects of e-commerce. “Prior solutions emphasized or focused on one or the other,” said Andrea. “Balance local needs with an eye towards the broader supply chain,” said Andrea. Local decisions could lead to inefficiencies as more product movements occur between locations. For example, some packaging or containers sizes may not cube a pallet. That balance can be hard to achieve, she added. “Try to keep the holistic view. What is the next step going to be? Can you reduce equipment? Will the product have to leave or go to another store?” An overarching goal should be to reduce what facilities have to buy, use, handle, or maintain. “What happens today may change tomorrow,” noted Andrea. A change may shift a worker from picking an order to a container on a conveyor belt to picking an order to a cart. Andrea urged analyzing product flow, collaborating with suppliers and listening to customers. Use that information to identify areas where efficiencies can be improved or savings increased — getting goods off a truck or conveyance faster, turning the packaging asset, using fewer employees, keeping store associates with customers. “Those are the conversations we’re having more often,” she said. Finally, be open to new ideas. Review the supply chain to ensure efficiencies in packaging. Design the best solution and implement it with the help of suppliers. They can provide models or prototypes for testing and provide the assistance needed for a seamless implementation.